There’s a new girl in Casper town, and she is just as cute as she can be. Her family has been waiting for her to get here for quite some time now, and the big day finally arrived yesterday. 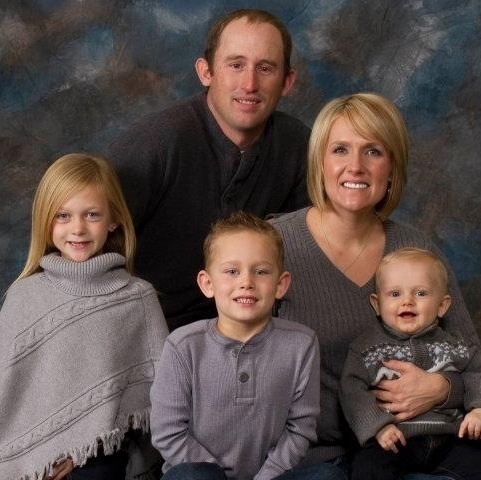 Cristan and TJ are the proud parents of this sweet little girl, and she is also welcomed by her big sister, Madalynn and her brothers, Ethan and Chase. What more could a sweet little girl ask for than a wonderful family who love her so much and are so excited that she has finally arrived. She was also welcomed by aunts and uncles and grandparents too, because babies are always the most exciting news. The Limmer family would like to introduce their newest addition. In fact they want to shout the news from the rooftops. Their precious little bundle of joy has arrived, so say hello to Rylee Rae. Rylee arrived on May 30, 2013, and weighed 6 pounds 7 ounces. She is 20 inches long, and she is just as cute as she can be. I have a feeling that her sister is extra glad to finally have another little girl in the house, since she has been pretty outnumbered around their house. Before you know it, Madalynn will be teaching little Rylee Rae all about being a girl. I see a future of cute hair styles and painted nails, not to mention all the most stylish clothes and shoes. Yes, I see a future that’s very girly in the Limmer house, and I don’t think that upsets anyone either…but, then again Madalynn likes to be goofy too, so I would imagine that there will be a lot of those moments in the Limmer house too. 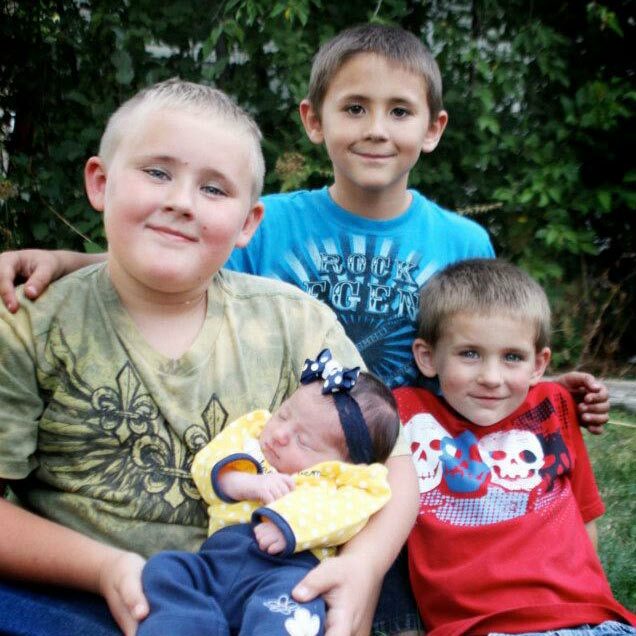 And then there are little Rylee’s older brothers. In her early years, they will show her how to be a tomboy, and in her teenaged years, they will be her protectors…as well as, the guys whose friends she will want to flirt with. Sometimes that will be ok, and other times they will wish she would get her own boyfriends, and leave their buddies alone. All that aside…for now that whole family is simply sitting back, and enjoying the moments. The moments when little Rylee Rae is so little and cuddly. The moments when she depends on them for everything, and everything they do for her will bring the cutest little smiles. The moments when she changes so much, developing new expressions and skills. All those sweet little baby moments, the first words, first tooth, first steps…the best days are always made up of those little moments. 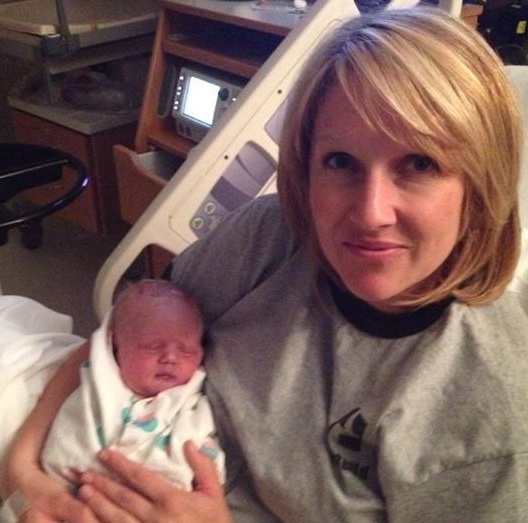 Congratulations to the Limmer family on the birth of their sweet little Rylee Rae. My grandmother, my dad’s mom, passed away when I was just two and a half months old, so I never got to know her. I have been told many things about her, and I’ve come to the conclusion that she was an amazing woman. 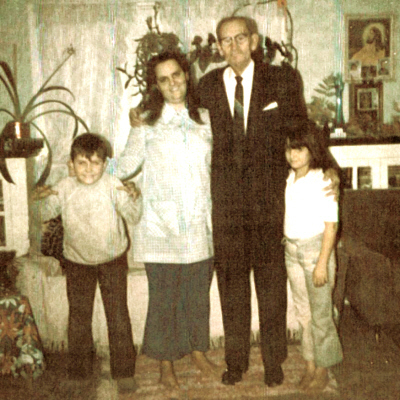 She worked as hard as any man, and raised her four children to be good and responsible people. She ran a farm, and expected her children to help out around the place. She could be fun loving and was a happy person, but when it was time to work, she expected the kids to do so without goofing off. She worked hard and she expected nothing less of them. And for the most part, they didn’t let her down, but kids will be kids, so there were a few situations that made Grandma…less than happy. 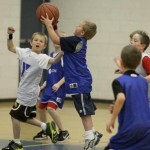 Unfortunately, kids and their parents often have different ideas, and it doesn’t even have to be just the little kids. 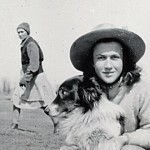 Taking a moment or two to have her picture taken with her dog was my Aunt Ruth’s way of goofing off, and when you look closely at this picture, you can see that Grandma was…not very happy with the situation, and then, there is the person behind the camera…who I assume to be my dad or my Uncle Bill. They just weren’t cooperating with her plan for the day. The dog seems to be the only one who knows that Grandma is not someone to mess with, but Aunt Ruth was never one to be scared of people, and like her niece…me, she was not afraid of a…difference of opinion. I don’t know if Aunt Ruth was as much of a challenge to her parents as I was to mine, but I think it is entirely possible. 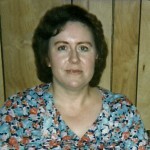 Aunt Ruth and I were so much alike, and I know that I was a definitely a challenge to my parents. 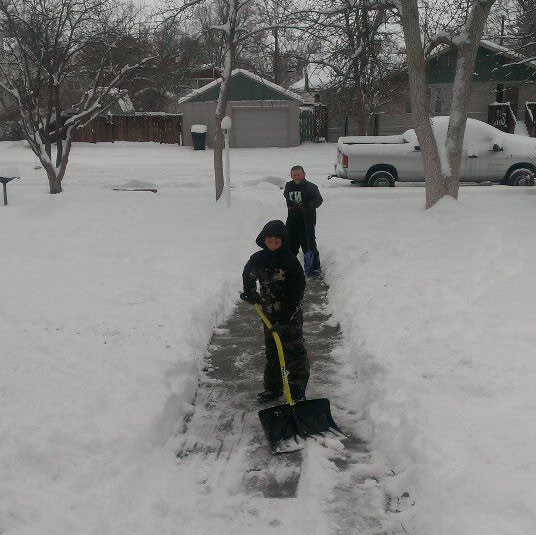 Still, Aunt Ruth was a hard working woman too…although, I’m not sure Grandma would have thought so at that moment. Kids might steal a moment or two to play when they should be working, but most kids grow up to be much like the parents who raised them, which would be a tribute to Grandma’s good upbringing, because all of her kids grew up to be workers. I don’t know if Aunt Ruth got in trouble for goofing off that day or not, but I do know that Grandma was getting to the point of losing her temper. It happens and kids are usually used to it, so they tend to push things as far as the dare, and no further, because one thing you had better know is that, Mom was not someone to mess with when she was angry!! While going through my father-in-law’s belongings, since his passing earlier this month, we have come across so many interesting things…things we knew nothing of, but should not have been surprised about. One of the things we found that was particularly exciting to me, was a box of old letters written back and forth between my in-laws, during the last months before their marriage. Old letters give their reader such insight into the true person the writer was. 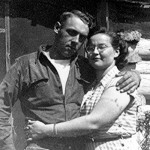 At that time, my she was living in Colestrip, Montana, and he was working in Rosebud, Montana. Being in love and so far apart is never an easy thing, but they made due, knowing that soon they would be together for the rest of their lives. While the letters always contained the usual “I miss you very much” parts, there was something else in one letter from my father-in-law that I thought was so sweet. In the letter he asked how his “girls” were doing. I looked up at the date on the letter, because he said “girls” and not girl. It was written on February 28, 1949…my mother-in-law’s birthday, and a little over 3 months prior to their marriage on June 6, 1949. So, what “girls” was he talking about? In the next sentences I found my answer. He clarified, when he wrote the name of that sweet little girl…Margaret. The little girl he loved so much and found to be so sweet, was my mother-in-law’s baby sister, who has long since been given the nickname, Margee. He went on to say, “I think she is the sweetest thing. I would like to have one just like her.” That comment brought tears to my eyes. It was just such a sweet thing to say, and it came straight from his heart. 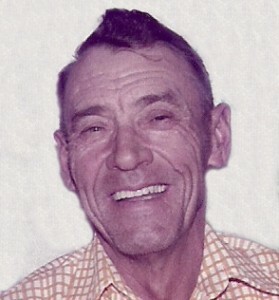 I have always found my father-in-law to be a very good judge of character, and in my opinion, he hit that one spot on. Margee has always been a sweet person, who is willing to help in whatever way she can, and when she retired, and we were at a place in my mother-in-law, her sister’s care, where she could no longer be left alone, Margee stepped up and sat with her whenever we needed to take my father-in-law to the doctor or hospital. That, in my opinion, proved just exactly what he had seen in her when she was just a little baby, and though I have always loved her, it so completely reinforced my feelings for Margee, that it…well, lets just say it will be impossible to ever repay Margee for all she did for us. When we needed her most, and she proved over and over what a “sweet” person she is. Dad saw something is his sister-in-law to be that would always make her dear to him. He had known her for all of her life and she had been his sister-in-law since she was just a little over 4 months old, so really, she was as much his little sister, as his sister-in-law, and she had never known a time when he was not in her life, so I guess he was more like a brother than a brother-in-law too. He got to see over and over what a sweet little sister she would go on to become. The few little lines he wrote in the middle of the letter, were not what the whole letter was about, but they leaped off the page as I read them…because I knew the rest of the story. I knew how that “sweet little girl” turned out, and how he had called it exactly right. She certainly was and is a very sweet girl. When you are a little kid, your friends are usually siblings or cousins. Since there is not much choice of who your friends are, at this age, all you can do is hope you get along pretty well. Thankfully for me and for my girls, that was exactly the case. While the girls had their typical little kid tiffs, for the most part, they were best friends. They did everything together. I didn’t have to find ways to entertain them for very long, because they took over that job very early on. As soon as Amy was able to play, they were always making up their own games. It was entertaining to watch them play. Corrie and Amy never fought much, and in fact, I actually had people comment on that fact. It made it easy to have them do things together. 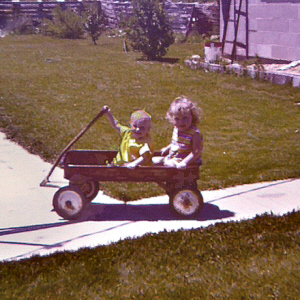 Everything from riding around in a wagon together or even riding…or being pushed on the same tricycle. They loved that neither of them had to wait their turn. 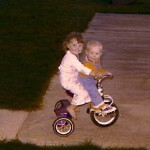 It also made Corrie feel like a big girl when she could hold her sister in place so she didn’t fall off. I loved how protective Corrie was of her little sister. It was very sweet. It’s not very often that you can turn a normal tricycle into a tricycle built for two, but when kids are little, you can fit two little ones on a tricycle. And Amy was just so excited to be on there. She felt like a big girl too, and when someone pushed them around the patio, they were in seventh Heaven. Of course, pushing a tricycle around a patio all day can get pretty old pretty fast. Nevertheless, to make for happy toddlers, pushing them around on a tricycle is the perfect solution…temporarily. Too much pushing the kids around the patio can make for happy kids…and worn out adults. Those early childhood days, when your siblings are your best friends, go by so fast. When I look at the fun my girls had, just hanging out together, it always puts a smile on my face. They are still close, but can siblings ever be as close as adults as they were as toddlers? I don’t see how they could. People get so busy, and besides, can anything ever compare to the fun times you had with your sister, when you were little kids? Kids these days don’t play the same games that kids of the past played. That is not such an unusual thing, because the times change, but it is sad to think that the kids today don’t know how to play games like Kick the Can, Red Rover, Jacks, or Marbles. When I was a kid, boys and girls alike played marbles, but there was a time, when marbles was pretty much considered a game for boys. Girls were supposed to be playing more ladylike games. 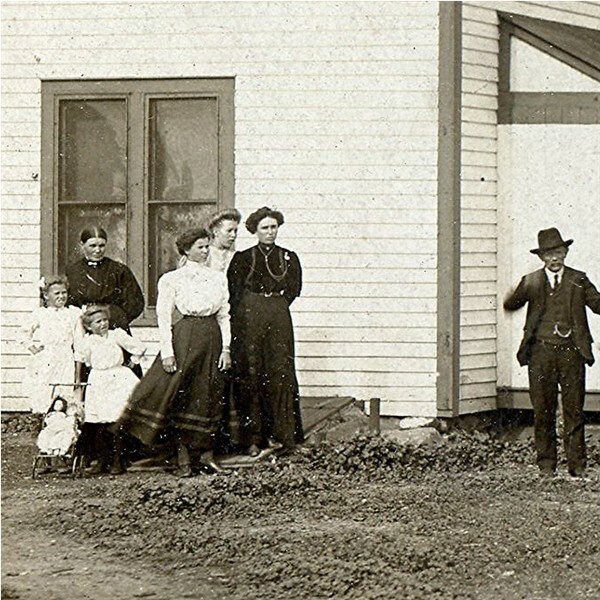 The little boy, who was my father-in-law, lived in such times, and he couldn’t wait to play marbles like the other boys around him. Then, one day, when he was in second grade, he found himself in possession of one marble. Now, it was a bit of a risky move to join in a game of marbles when you had just one marble, because if you lost it, you were done. Still, what good was one marble if you kept it in your pocket and never took a chance to win more. 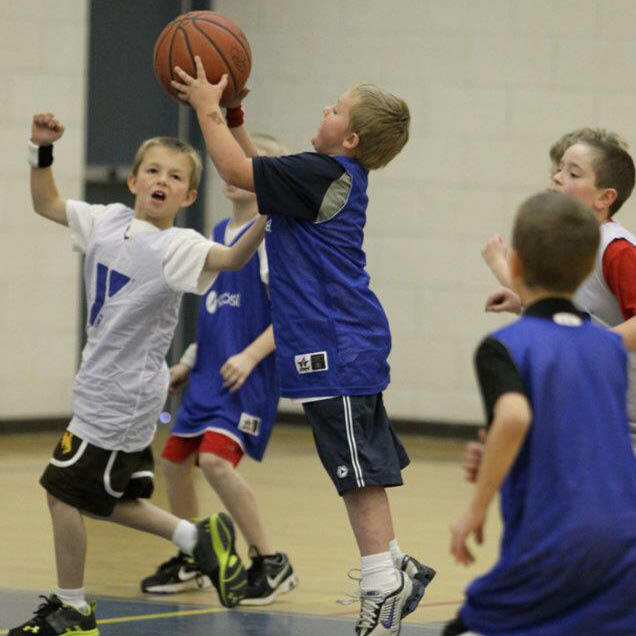 The thought of being afraid to play…well, it just never occurred to little Walt. He got himself into the first game he came across, and played his little heart out. He didn’t lose the first marble he ever had, and began winning right away. I can just imagine how proud he was when he showed his mom his take that first day. And winning that first marble, probably got him immediately addicted to the game. I can picture him practicing at home, all by himself, so that he could get better and better at the game that he loved so much. And, get better, he most certainly did. 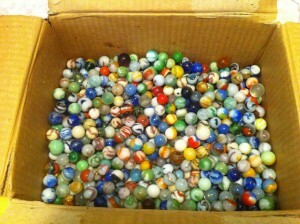 Before long, he was the winningest marble player in the area, and by the time he got to be too old to play such kid games anymore, he had won a good sized box of marbles. So many in fact, there was no way he could possibly take all of them to each match he played. 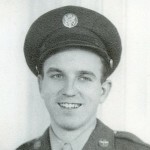 That little boy is gone now, as is the man who is my father-in-law, but his legend lives on, in his little brothers. 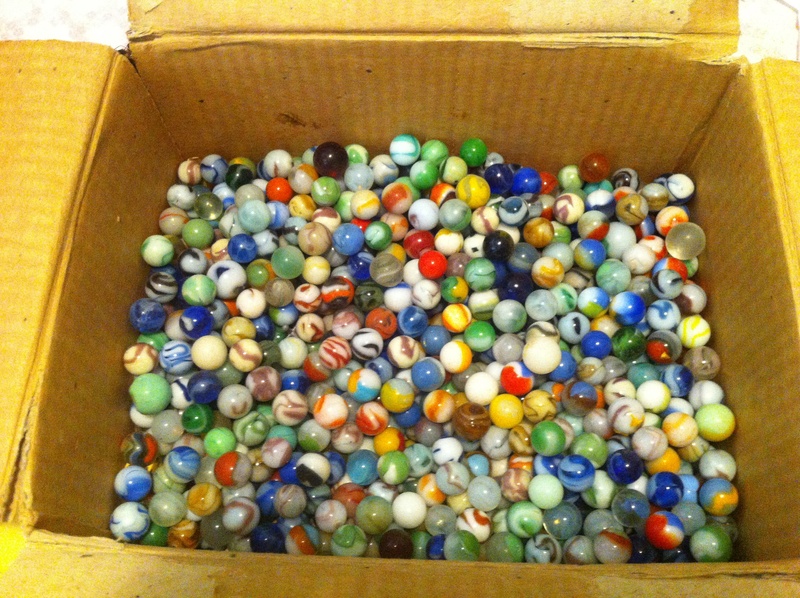 While in town, for the funeral of his brother, Uncle Butch asked us about the box of marbles. None of us knew anything about it, as he had never mentioned it to us. As we went through the house, going through his things, we assumed that the box os marbles must have, long since, been given away…until yesterday, when we came across them again. They were in the same old box that had once held a lunch pail, safely tucked on the top shelve of the closet, because even though the little boy had outgrown the game of marbles, the little boy still lived in the memory files of the man who became my father-in-law. As a kid, and young mother, I felt like little boys were almost alien beings, and since the arrival of my three grandsons, I find myself thinking maybe I was right. No, not really, but I think they are so funny sometimes. If someone is taking a picture, leave it to a little boy to make a funny face or turn into a tiger or monster. And, while little boys are often the ones who act goofy in those pictures, that doesn’t mean that the big boys and the men can’t do the same. It seems to be in their nature. 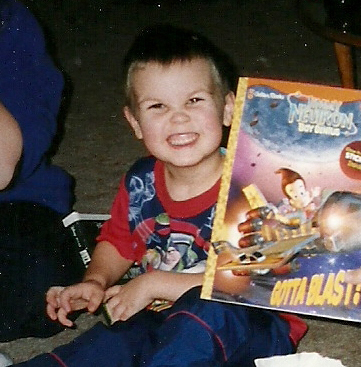 My cousin Jimmy…Jim now, of course, was just one such kid. When his mom and sister were posing nicely with Grandpa, Jimmy just couldn’t resist the urge to turn into a tiger for the picture. Or maybe he was the Incredible Hulk, or a monster. I’m sure we will probably never know, because I doubt that he even remembers this picture, but unlike Vegas, what happens in a picture is there for all to see. That may not be ok in just everything, but Jimmy being a tiger…that is ok in my book. I do have to wonder though, if he doesn’t turn into the tiger now and then when he is playing with his niece and nephews. Yes, I can see that in him for sure, and I’ll bet his family can too. My grandsons, like in this picture of Josh, all took turns becoming a tiger or something just a fierce, and looked just as cute doing it as Jimmy did all those years ago. They can’t help themselves. Someone raises a camera for the picture and all that goofiness just come tumbling out. Most girls can sit still, and pose nicely, but boys…and even a lot of men, are just too full of wiggles and goofy ideas. Sitting still and not making a funny face is almost impossible, and if you ask me, that is ok too. I mean, we would wonder if something was wrong if they didn’t make a face or goof off in some other way. All that goofiness is just the way they are. Sometimes, you come across a picture that looks simple enough at first. Then upon closer examination, you see that something seems to be wrong here. I have often wondered what was going on in this picture. Here you have 13 horses all tied to one rope, that is obviously not anchored in any way, because it takes 2 men and a boy to keep them in place. It seemed innocent enough to me at first, or maybe I just didn’t look at the picture closely enough. I guess that the 2 men and a boy didn’t exactly strike me as being an odd situation…until I looked closely at the 4 women and 2 girls standing off to the side. Their faces didn’t look right, even in a time when people rarely smiled in pictures. While the wind is blowing some, it seems very clear to me that these women, my great grandmother and her girls, are concerned about what the men, my great grandfather and their two sons, are doing. 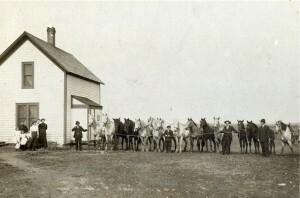 The men also seem to feel like whatever they are doing, is possibly dangerous enough to warrant keeping the women back to a safe distance, and the need for 4 people to hold the horses in place. Of course, my curious mind has been going back and forth on this matter for days. I can’t decide if there is to be a race, which seems odd, because it would be impossible to release all of the horses at the same time, when they are all tied to the same rope. The horses don’t act wild, so it seems unlikely that they are concerned about anyone getting kicked or run over, especially considering the boy and the man that are in the midst of the horses. It is obvious to me that they are not just watching the horses for someone else, because with the exception of the horse with the man observing at the end of the string of horses, none of the horses pictured have a saddle on. My guess is that they are at an auction, and they are selling the horses, but if that is the case, then, I can’t exactly figure out why the women look so concerned. My curious mind may never know the answer to that question, so all I can do is speculate. 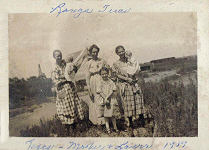 Ranger, Texas had been an agricultural center, becoming a wheat producing center for the north, until a drought in 1917 hit the town crops very hard. 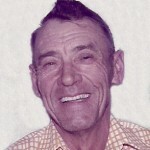 That was when a few residents encouraged William Knox Gordon (who could be relation to Bob’s family, but I have not confirmed it) who was vice president of the Texas Pacific Coal and Oil Company, to test for oil in the area. He found oil, but the first well drilled, the Nannie Walker No. 1, was somewhat of a disappointment, as it first produced gas and only later blew in oil. Then, in October 1917 the McClesky No. 1 came in, reached a daily production of 1,700 barrels, and began a mammoth oil boom that drastically changed Ranger and Eastland County. In the summer of 1918, my grandparents sold their homestead in Minnesota and headed south, finally settling in the town of Ranger, Texas. Like so many people, the oil boom in Ranger had drawn them in search of better times, and oil meant better times. 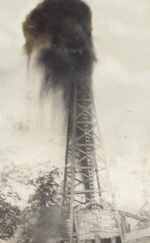 There were many oil wells near and even in the town of Ranger during those years, and that meant that the residents could never escape the smell of oil. That is something we here in Wyoming can understand…or at least any of us who have been through the town of Midwest. You know you are getting close to Midwest, because your proximity is announced by the pungent smell of oil. I suppose if you are an oil tycoon, that might just smell like money, but to me…it smells awful. During those years, there was a danger that the people of Ranger lived with every day. With so much drilling going on, so close and within the town and with the drought continuing, the possibility of out of control fires when an oil well came in and caught fire was a daily concern. 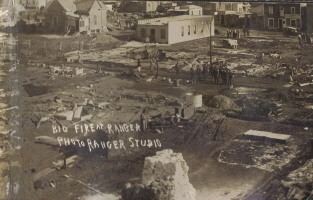 There were several such fires, including the one on April 6, 1919, which took out 2 city blocks in the town. It is hard for me to think about how my grandmother must have felt with those fires being a daily possibility…especially after the one that happened on April 6th. My Aunt Laura was just a little girl of 6 years when the April 6th fire hit the town. The worry of trying to get your little girl out of harms way, must have weighed heavy on my grandparents’ minds. She could be outside playing with friends, or sleeping, or any number of other reasons that could make a quick escape difficult. Nevertheless, the little family survived that constant threat of fires and after getting their fill of the Texas oil fields, returned to Wisconsin, at some point before my Uncle Bill was born in 1922, where they would remain for the rest of their lives. My grand nephew, Xander is the oldest of the five children of my niece, Jenny and her husband, Steve. He takes his job as the first born very seriously. Like any kid, he has his fights with his two brothers, but that has nothing to do with his duties as the big brother. 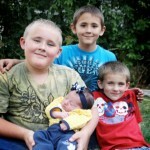 They are his little brothers and his little sister, and they are his top priority. Xander is wise beyond his years and knows the value of life…possibly because he has already experienced loss in his young life, having lost his sister, Laila when she was 18 days old and he was seven years old. It was an event that made his tender heart break. Now, like his brothers, he brings little gifts to the sister he won’t get to know on this Earth, because his big brother’s heart feels so much love for her. As the oldest child, Xander tries to always be a good role model for his younger siblings. That means studying hard and getting good grades, so he can encourage them to do the same. It also means that he works hard at whatever job he is doing, because he knows that it is the right thing to do…to always do your very best work. So that’s what he does whenever he is asked to help out around the house…he works hard at it and does the job right. And it means that Xander stays out of trouble, because how can a big brother be a good role model for his younger siblings, if he is getting in trouble all the time. He is the kind of boy who makes his parents proud, and makes his brothers want to be just like him. He is a good and loving boy. In his leisure time, Xander participates is sports…of all kinds. He likes to play football and basketball. He also studies Tae kwon do. He likes to ride motorcycles and snowmobiles. He’s tried lots of sports, but football is his very favorite. Like his dad, he also loves guns, and loves to go out the range to do some shooting. Of course, any guy who likes gun, likes to hunt, and Xander is no exception. After passing his Hunter Safety Course in mid-March, I’m sure that he is very excited to go hunting with his dad this fall. All in all, Xander is just an all around boy. Today is Xander’s birthday. Happy birthday Xander!! We love you very much!! Have a great 10th birthday! !